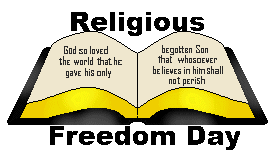 Click here to go to all sections dealing with religious liberty in America. Early in the colonial period, men formed the first notable government that legally protected separation of church and state and religious liberty. This historical event arose out of a conflict between the two currents which flowed in opposite directions. Many brave men and women, with Baptists at the forefront, paid a high price on the path to religious liberty and freedom of speech, association, and the press. One should not forget that those people were motivated by a deep love for God and his word, not by earthly concerns. 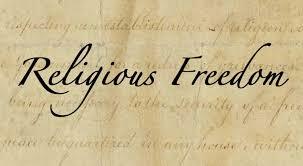 As a result of the fight, Christians, and everyone else in America, have religious freedom. The United States Supreme Court still upholds the wall of separation between church and state and freedom of conscience. Christians in America have been blessed above measure and can choose to please God and not be persecuted for it. The brief time men will be on earth is miniscule compared to eternity. The time an individual Christian is here is nothing more than a blink of the eye. An American believer now has the opportunity to glorify God without persecution. That opportunity was the result of the trail of blood left by the martyrs for Christ. If the Son therefore shall make you free, ye shall be free indeed (John 8.36). Every breath a believer takes out of God’s will is a wasted breath. He will praise God naturally, not as a matter of choice, in heaven. This is his one chance, during his eternal existence, to live for Christ of his own free will. This is the one shot he has to choose to please, serve, praise, and glorify God. After leaving this world, some will learn, when it is too late, that they never glorified him when they had the choice. Some will learn that they did not proceed according to knowledge, understanding, and wisdom; and that they followed and promoted the principles and goals of the god of this world. Isaac Backus, A History of New England With Particular Reference to the Denomination of Christians called Baptists, Volume 1 (Eugene, Oregon: Wipf & Stock Publishers, Previously published by Backus Historical Society, 1871), pp. 408-409. See Jerald Finney, God Betrayed, Separation of Church and State: The Biblical Principles and the American Application (Xulon Press, 2008 (www.xulonpress.com), Section V. Sadly, while upholding that wall of separation, the Court has also twisted the meaning of the First Amendment so as to remove God from practically all civil government matters.